In the art world, a “ready-made” is a common object elevated to the status of art through the gesture of an artist who either incorporates that object into a larger work or simply declares: This object is art. Marcel Duchamp famously introduced the concept in 1917 when he submitted a urinal to a gallery exhibition. Nearly a century later, Mary Ellen Carroll moved a house. She moved it as a work of art, a way to “make architecture perform.” In fact, she rotated the whole lot, so an entire abandoned property in a first-ring Houston suburb turned its back to the street, like a stage actor who abruptly wheels about-face from the audience. Most cities’ zoning laws would prohibit such a performance, but Houston doesn’t really have those rules. Carroll used this policy — or lack thereof — as ready-made, as material for her art. She took what existed in a city and spun it, to make us look. In October, Carroll unveiled her latest work, Public Utility 2.0, in the modest showroom of the American Institute of Architects’ New Orleans office. 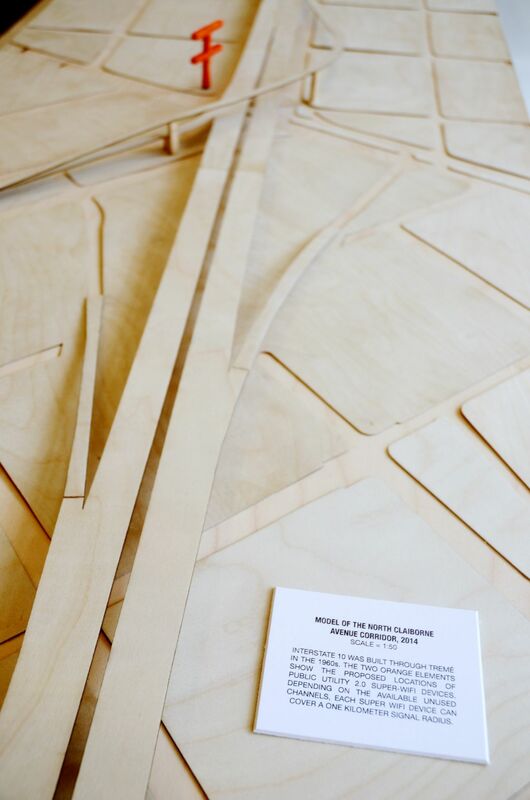 The exhibition — part of the international art biennial “Prospect.3: Notes for Now,” underway in the city until January 25th — consists of infographics, some photographs, a historical timeline and a delicate wooden model of the elevated I-10 freeway that cuts through New Orleans. What she displayed was merely a suggestion of the artwork to come: a project, years in the making, that aspires to nothing less than a reshaping of the policies and technology we use for wireless communication. For Public Utility 2.0, Carroll and her collaborators plan to install Super WiFi transmitters — first-of-their-kind experimental device developed at Rice University — along the section of Claiborne Avenue in New Orleans that runs beneath the elevated I-10 expressway. The surrounding residential area has very low rates of broadband access, simply because many people cannot afford the bill. At a basic level, Public Utility 2.0 could provide free high-speed Internet within roughly a mile radius of each transmitter, connecting scores of people who can’t otherwise afford to connect. But the potential for the currently unused spectrum is far greater: With free public access to these powerful channels, new technologies and broadly accessible communication networks could develop. This project could be their showcase. For precedent, Carroll points to the FCC’s 1994 decision to open up as a platform for innovation what were at the time considered “garbage frequencies” — the realm of baby monitors and garage door openers. Those are the frequencies that now host WiFi. Physical places these days tend to have online counterparts. Every city — perhaps every neighborhood — has a corresponding aggregate of articles, photos, maps, Yelp reviews, Craigslist ads, tweets, memes and other ephemera that describe what’s in it, and what that place is like. Taken together, these aggregates are what geographers Michael Crutcher and Matthew Zook call “cyberscapes.” Their research shows that, in a city like New Orleans — and a neighborhood like the one where Public Utility 2.0 is centered, Tremé — a cyberscape left to its own devices can reflect and perpetuate deep-seated injustices that already exist in a physical place. At the same time, the neighborhood was violently reshaped throughout the 20th century by urban renewal and highway projects — a process repeated across the nation by white governments exploiting African-Americans’ political disempowerment. In the 1920s, the city razed blocks of homes and displaced hundreds of families without recompense to build New Orleans’ Municipal Auditorium and what became Louis Armstrong Park. In the 1960s, it destroyed the crucial black business and social corridor along Claiborne Avenue to build the elevated I-10 expressway, where Carroll proposes to install the Super WiFi transmitters. 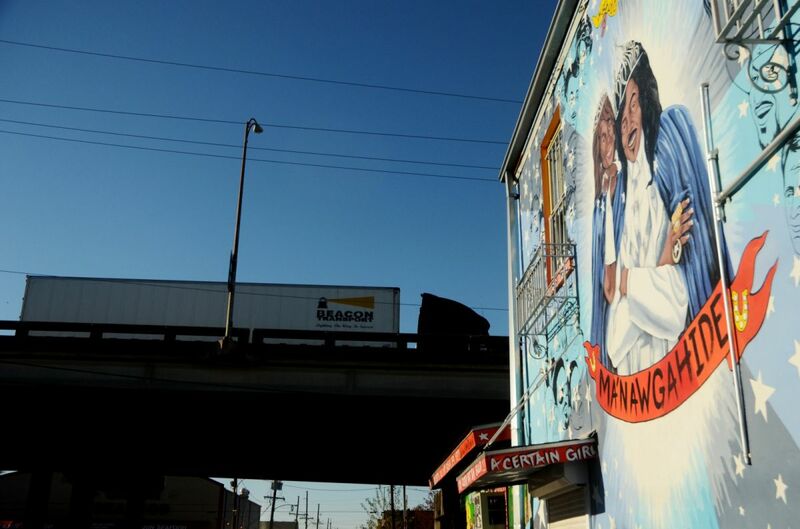 Today, what Crutcher calls the “deterritorialization” of Tremé’s longtime residents continues via the ongoing redevelopment of the neighborhood, which has made the historically mixed-income neighborhood prohibitively expensive for some renters and eroded generations-old ways of living for others who remain. Online, the development of Tremé’s cyberscape mirrors this deterritorialization. In a city of low broadband user rates — 56 percent in New Orleans, compared to 68 percent nationwide — Tremé’s longtime, predominantly African-American residents remain among the least connected. As the Internet becomes an increasingly important venue for cultural production, the very residents responsible for producing Tremé’s robust culture are cut off. This is not to say Tremé has a meager online presence. Quite the opposite. It’s easy to go online and find an Airbnb listing in Tremé, a Segway tour, a clip of David Simon’s HBO series, a renovated house for sale or a promotional profile of the neighborhood by the city’s tourism apparatus. It’s harder to find the voices of the people who made Tremé important in the first place. The way the neighborhood is constructed online has little input from its longtime residents — just as they had little input in the decisions to level people’s homes or build a freeway. 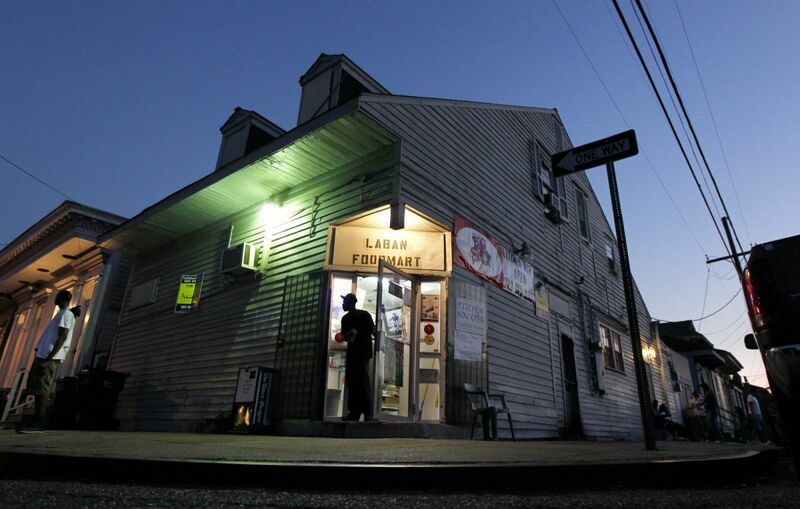 The Mother-In-Law Lounge is a Treme landmark. If Public Utility 2.0 aims to impact the broader discourse around the Super WiFi spectrum, it’s going to have to do more than bathe the residents of Tremé in Internet signals. Carroll knows this, and thus the second part of her project: community outreach. Although the technology Public Utility 2.0 employs is relatively new, this is not the first time it’s been put to use in an urban setting. In 2004, a Houston nonprofit called Technology for All decided to give free computers to low-income residents of a neighborhood not far from Rice University’s Houston campus. It was a relatively simple project until the nonprofit realized that few of the households getting the computers had the Internet access needed to fully make use of them; the organization would also need to connect them if it wanted its investment to make a difference. Quickly, TFA installed a mesh network that provided access for free to more than 4,000 people. One woman, however, wasn’t satisfied with her service. TFA began talking with engineers at Rice University about the WiFi transmitters they were building. The same dynamic has been at work in Tremé. When the neighborhood’s Lafitte public housing development was recently rebuilt, the developer, Providence Community Housing, included two WiFi-equipped computer labs for residents. They stopped short of asking firms to donate used computers for their low-income residents to use at home precisely because they foresaw the situation TFA found itself in — people with computers and no Internet. Neither the organization nor many of its residents could likely cover the recurring fee, which runs about $40 a month. Through its Sojourner Truth Neighborhood Center, Providence provides people who live in its housing as well as the surrounding community with free programs in job readiness, wealth development, senior services and youth development. All of these heavily involve Internet access many participants lack. The center offers computer literacy courses three days a week. But building computer literacy is difficult if one only has Internet access in a classroom. Connectivity is only part of Carroll’s concern. 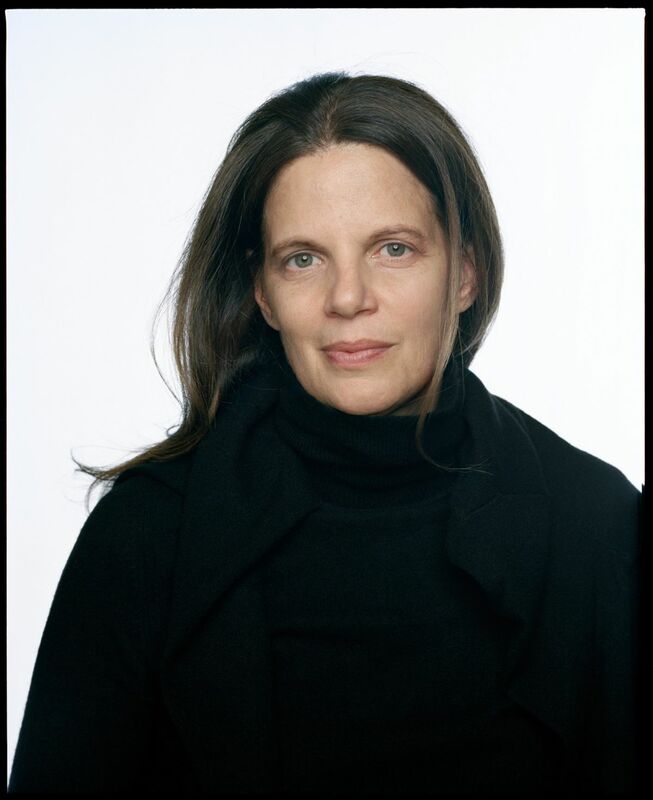 As an artist, she conceives of creating a structure from the spectrum, and of her role as that of an architect. Carroll stresses that Public Utility 2.0’s growth will be organic, almost improvisational, moving through an exploratory phase to the places it will do the most good. This process will influence who will be the first to create and produce in the spectrum her project provides access to. Early enthusiastic partners include David Freedman, the general manager of WWOZ, a local listener-supported radio station that strongly supports live music and specializes in the jazz and rhythm and blues that grew up in Tremé. 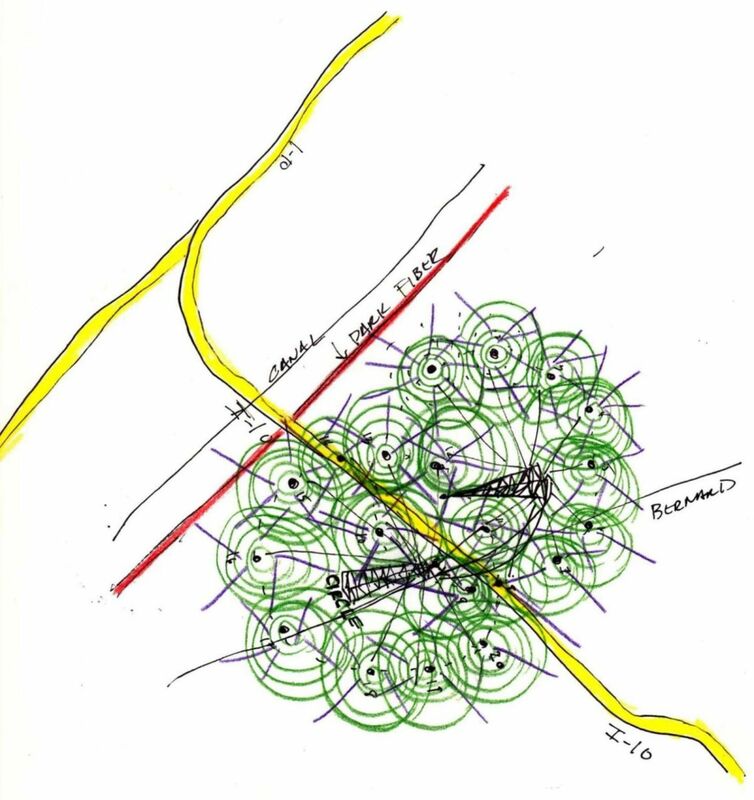 Freedman imagines using Super WiFi — whose frequencies transmit large quantities of data farther and faster than conventional means — to allow student bands at schools across the city to practice together in real time. Through a firm in California, Carroll plans to work with local Delgado Community College on a Super WiFi-related workforce development program. To be sure, there already exists an urgent sense among many New Orleanians to preserve place-based knowledge amid the city’s shifting post-Katrina landscape. Author and folklorist Mona Lisa Saloy says she is in the process of launching an oral history project in partnership with Dillard University, where she teaches, to record video interviews documenting the modern Creole history of the 7th Ward, a neighborhood adjacent Tremé that would also fall within the reach of the proposed initial locations of the Super WiFi transmitters. She noted that the 7th Ward has broadband user rates as low as 10 percent, but that one can buy a tablet at Walmart for as little as $45. Local social aid and pleasure clubs, musicians, and schoolchildren have also worked to publish a series of books with the nonprofit Neighborhood Story Project that celebrate local neighborhood traditions. It’s easy to see how such efforts could translate online with the help of increased connectivity. Carroll envisions scores of transmitters eventually connecting the entire Greater New Orleans region, enabling scientists to remotely monitor regional waterways and fishermen to coordinate deliveries of their haul while still out at sea. And, indeed, the project’s ripples could affect the FCC’s decision as to whether it should leave significant portions of the Super WiFi spectrum unlicensed. The FCC is scheduled to address this question sometime next year. It’s expected to buy back licenses from former television broadcasters and then decide whether it wants to make tens of billions of dollars re-issuing them to telecommunications companies or leave the spectrum open as a space for innovation. Harold Feld, senior vice president of Public Knowledge, a think tank in D.C. that advocates for open Internet and public access, says the easiest thing for the FCC would be to license and sell rights to the spectrum piece by piece, and that advocates for the unlicensed spectrum will have to make a convincing case. He says that projects like Public Utility 2.0, if implemented well, can provide strong evidence for their arguments. But however far-reaching Public Utility 2.0 becomes, it’s no accident that Tremé is its locus. Artists can elevate ordinary objects by designating them artworks; Duchamp had the power to transform a urinal into the stuff of legend. Public Utility 2.0 is indistinguishable in many ways from its precursor in Houston, but its execution by a prominent artist transforms it into something other than a simple act of technological benevolence. Its attachment to an urban space, Tremé, that’s at once fetishized for its history and culture by outsiders (who are encouraged by tourism promoters) and a contested space between new and longtime residents heightens the project’s scale, making it more prominent than it would be in any of New Orleans’ many other neighborhoods with low broadband user rates. 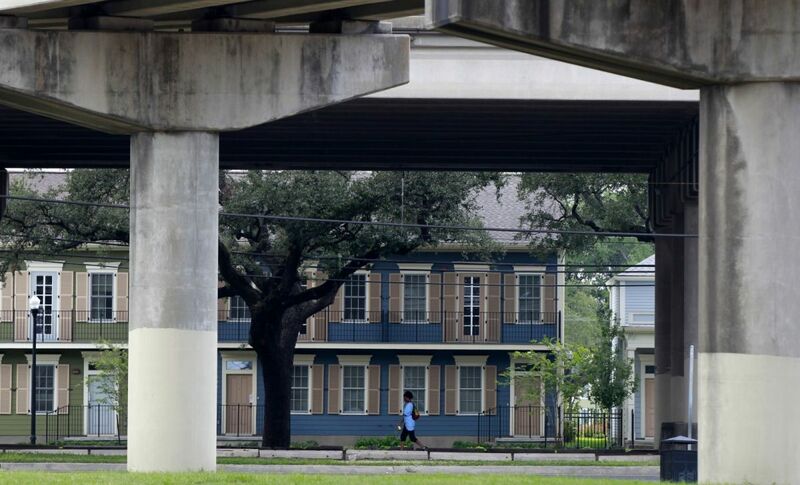 Tremé has become a target for developers whose ambitions range from flipping houses to tearing down the I-10 expressway, the latter a local controversy that gained national attention among urbanist sets. Public Utility 2.0 may take years to carry out, and in that time the influx of new residents gentrifying the neighborhood might transform it completely. But there will still be need — there will remain a digital divide that hobbles poor people’s ability to meet the daily demands of the Internet age and prevents them from taking part in creating their neighborhood’s identity. Whatever its merits as an artwork, one hopes Carroll’s house made out of spectrum will include entryways for those who most need it — the Sojourner Truth Center can’t provide free computers and literacy courses for everyone.